Apple’s digital assistant, Siri, has grown in capability quite substantially during the time that it has been around. Since being introduced to iOS 5 on the iPhone 4s, Apple has continually improved Siri’s capabilities by providing additional intelligence and integrating different solutions into its programming to allow it to do things like offering restaurant suggestions, theater listings, real-time sports scores from a variety of disciplines around the world. Obviously, Siri is also pretty good at arranging meetings, interacting with HomeKit accessories, and even looking things up on the web. But, did you know she can beatbox? Siri is no stranger to bizarre requests. Apple’s digital assistant has been delivering relatively humorous answers to questions like “what does the fox say?”, “what are you wearing?”, “does Santa Claus exist?”, and even “what is the best way to dispose of a body?” If the answers to those few questions aren’t entertaining enough for you, then you might want to try something a little different and ask “Siri, can you beatbox for me?” Siri’s response is a textbook – albeit somewhat a bizarre sounding – retort that’s straight from the beatbox 101 manual. Budding beatboxing fans can learn a lesson from Siri on this one. Asking Siri the beatbox question results in an immediate response of “here’s one I’ve been practicing”. Apple’s digital assistant then immediately enters into a verse of “boots and cats and boots and cats and boots and cats” and “cats and boots and cats and boots and cats and boots”. It’s definitely immediately entertaining, but if the response seems a little bizarre then it’s worth noting that the “boots and cats” lesson is a rudimentary building block of good beatbox session. It’s not something that you could listen to over and over again so it’s definitely not going to replace your favorite track. With that said, it’s definitely worth a listen. Siri’s beatboxing skills were actually discovered back in November of 2015, but have just started making rounds on social media in the last few days. This also raises the question; what other talents has Siri been afforded by its Apple masters, that we mere iPhone and iPad owners just don’t know about yet? No doubt people will be asking a slew of random questions in the hope of finding the next entertaining aspect. 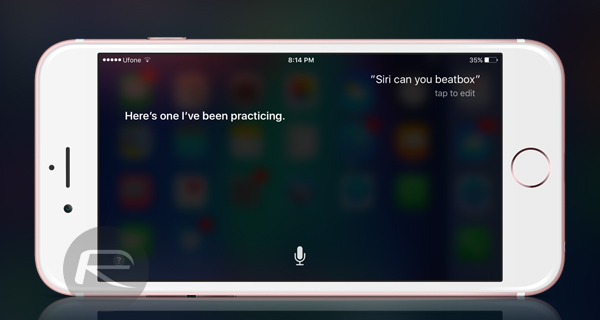 For now, check out the video below showcasing Siri’s beatboxing talent.